Last edited by TonyTheTiger20; 10-04-2018 at 07:25 AM. Kidding aside, thanks for doing the summary. No problem, happy to have found an easier way to have the spreadsheet do all the work! Totally agree but I guess winning is better than losing no matter how it gets done. I can’t place a team that hasn’t played in the top 10. Last edited by Puckdrop14; 10-06-2018 at 11:13 PM. Last edited by arenalife; 10-08-2018 at 07:14 AM. I never understand this. You wouldn't think Clarkson was one of the 10 best teams if they hadn't played yet because of when their games start? 10. Mercyhurst - need to give them some love. They lined up the most brutal early schedule possible and didn't embarrass themselves. 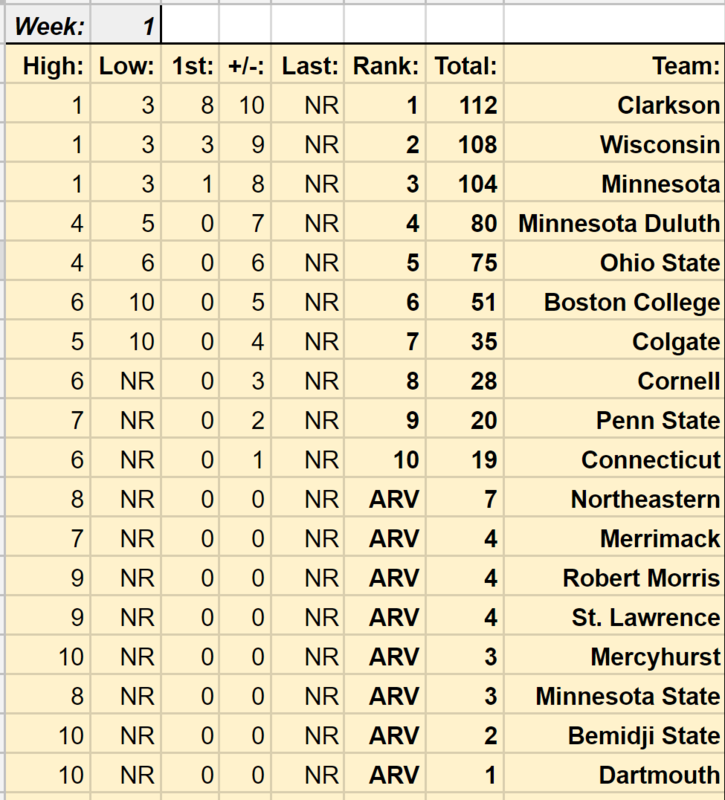 I am not saying Cornell is not one of the top 10 teams. What I am saying is that I can’t rank them until they play. I would have the same answer for any team that hasn’t played whether it’s Clarkson, Wisconsin or BC. They will find their way into the ranking once they play if they deserve to be there. No you are actually literally saying Cornell is not one of the top 10 teams lol... You said "here is a list of the top 10 teams, and Cornell is not one of them"
I said I can’t rank a team that hasn’t played in the top 10. They may be #1 for all I know however until they play I will not rank them. If you don’t like my answer, don’t use my ranking in your calculation. Thanks. I take it you're not a big believer in pre-season polls, eh?